This year, nine University of Nebraska-Lincoln students, as part of the 2019 Corn and Soy Collegiate Ambassador Program, are getting the chance to learn more about the corn and soybean industries. The Nebraska Corn Growers Association and Nebraska Soybean Association launched the Corn and Soy Ambassador Program to give students a comprehensive understanding of the industries. 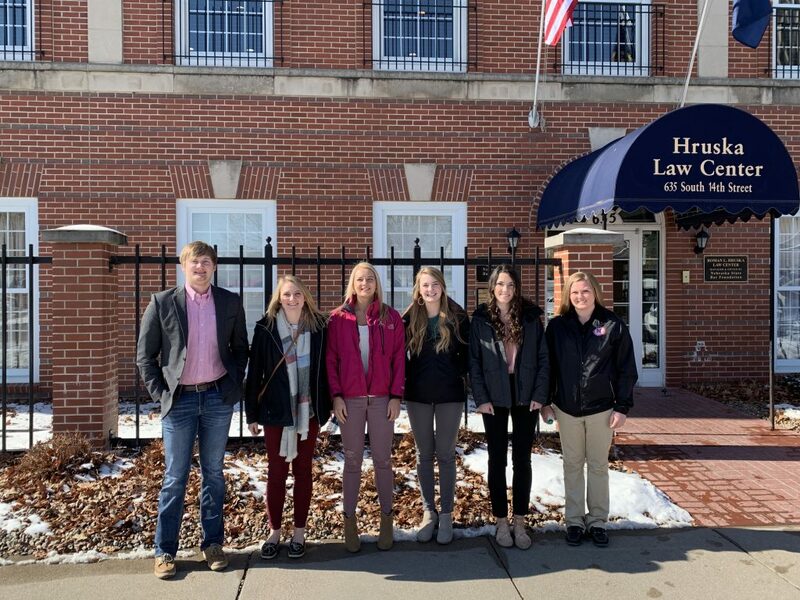 The program’s goals are to educate the students about state and federal policy issues affecting agriculture, and opportunities available to them from supporting organizations like the Nebraska Corn Board, Nebraska Soybean Board and the University of Nebraska-Lincoln. Following the completion of the program students will be recognized at the annual meetings of the corn and soybean associations, and each will be presented a $500 scholarship to help them with school expenses. Funding for portions of the program is being provided by the Nebraska Corn Board and Nebraska Soybean Board. During the year the ambassadors will take part in four seminars. The first seminar covers state and federal policies affecting the corn and soybean industries. The second seminar will focus on the role of checkoff programs in promoting corn and soybeans. During the summer students will partake in an ag industry bus tour. Stops will include different facets of the ag industry including manufacturing, production, and processing. These stops will hopefully give students more insight into potential jobs and internships in the industry. During the course of the program students are asked to spend time to promoting the state’s corn and soybean grower associations and checkoffs at promotional events such as Husker Harvest Day and Soybean Management Field Days. Following the events, they are required to report on their experiences and what they’ve learned. The Nebraska Corn Growers Association and Nebraska Soybean Association would like to congratulate the recently graduated seven members of the 2018 Corn and Soy Ambassador class on a successful year. For more information on the program, contact Morgan Wrich, Nebraska Corn Growers Association at 402-438-6459 (mwrich@necga.com) or Lori Luebbe, Nebraska Soybean Association at 402-441-3239 (lori@nebraskasoybeans.org). The Colfax Dodge County Corn Growers Association is please to announce that applications are now available for the 2019 scholarship. The intent of this scholarship is to help young people pursuing a future in agriculture with additional financial support. It is the hope of the Colfax-Dodge County Corn Growers Association that youth will continue to find their future in agriculture. The scholarship is open to any graduating senior, who is the son/daughter of an active Colfax-Dodge County Corn Growers Association and is pursuing a post-secondary education at any two or four-year College, University, or Trade school. The local association will be awarding one $500 recipient in the Colfax county school system and one $500 dollar recipient in the Dodge county school system. All applications must be post-marked by Friday, March 22, 2019. Dodge County applicants should send their applications to Dodge County Extension office. Colfax County applicants should send their applications to Colfax County Extension office.